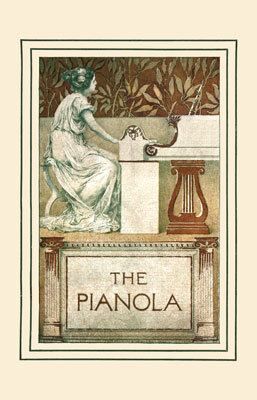 Cover of the first Aeolian Company Pianola Catalogue - New York, 1898. 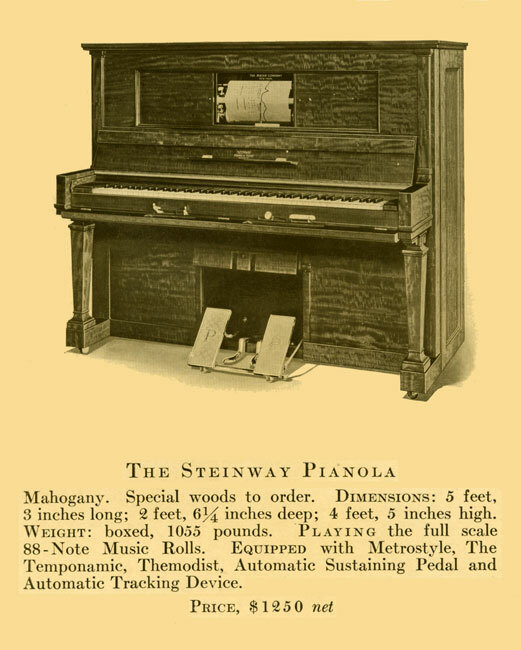 The first true Pianola was completed by Edwin Scott Votey in a workshop at his home at 312, Forest Avenue East, Detroit, by the spring or summer of 1895. Votey later joined the Aeolian Company, which put the instrument on sale in the USA in the autumn of 1898, and in Europe a month or two later. 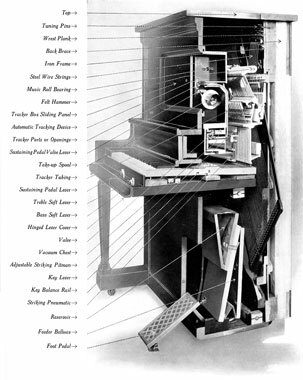 But the Pianola and its competitors were not simply the invention of any one person; E. S. Votey's particular contribution was to draw together a number of existing mechanisms which rendered his creation the first truly musical piano-playing device in the world. to the Smithsonian Institution, Washington, on 1st December 1922. At the start of this historical overview, we should define the most important terms. Edwin Votey's Pianola was so successful that its name came to be used by the public for almost any type of player piano, and the Aeolian Company shrewdly took one or two of its competitors to court for infringement of the trade mark. 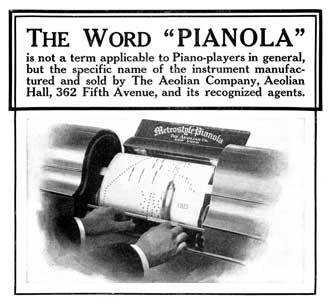 Aeolian was no doubt secretly delighted that its Pianola should have taken on a generic quality, and in truth most of its competitors' instruments had their own proprietary names, including the Angelus, the Cecilian, the Apollo, the Simplex, and perhaps most wittily, the Tonkunst (German for "musical art"), manufactured by Tonk Brothers of New York, whose other unintentional legacy to the musical world was the unfortunate expression honky-tonk. 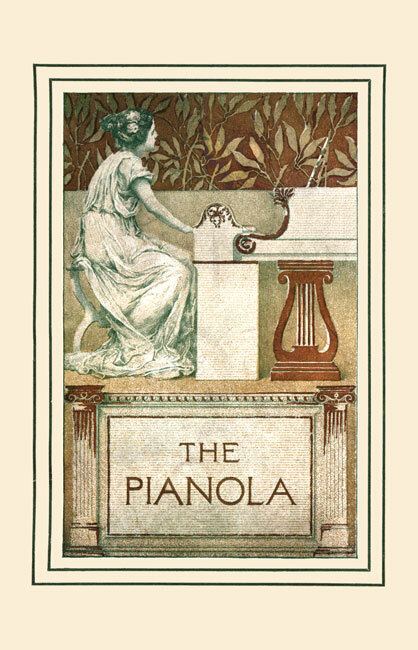 There is only One Pianola! 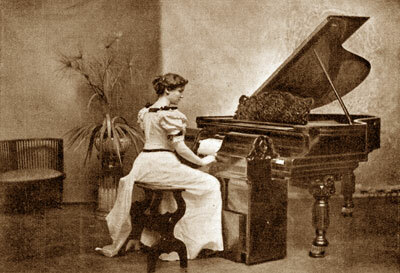 Generically, such piano playing instruments, which sat in front of normal pianos and played them by means of a series of felt-covered fingers, were known as Piano Players. The Pianola with Grand Piano - New York, 1898. Within a few years, the mechanism of these push-ups, as they are colloquially known nowadays, was also built in to normal pianos, and these were called Player Pianos from a generic point of view. Not surprisingly, the Aeolian Company's player pianos were usually given the title of Pianola Pianos. The Steinway Upright Pianola Piano in 1914. The original use of the word Pianola as a trade name has long since disappeared, and it has passed into the vocabulary of music as a succinct term for the foot-operated player piano, in contradistinction to the Reproducing Piano, an automatic player piano which plays back rolls recorded by famous pianists and composers. Pianolas are brought into operation by means of suction power generated by the pianolist's feet, and controlled in pitch by a perforated music roll. It is the difference in suction levels within the instrument that operates the various mechanisms, and in passing it may be noted that vacuum is not involved, at least not in an absolute sense. A pneumatic vacuum is a complete absence of air, and any player piano would instantly implode if subjected to such enormous forces. The greater the suction at any one instant, the louder a particular note or chord will sound, and the conscientious pianolist must learn to control dynamics as rapidly and subtly as a normal pianist. For a more detailed explanation of player piano mechanisms, see our How It Works page. A cut-away view of an Aeolian Player Mechanism in 1914. 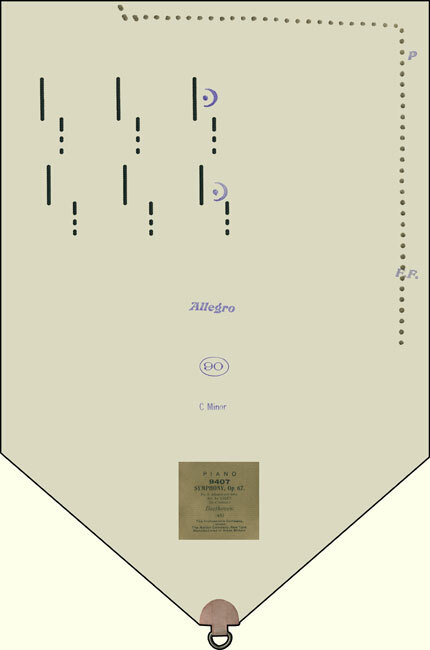 The vast majority of music rolls for the normal pianola were not recorded at a keyboard, but simply perforated by a technician after being marked up in pencil with reference to the original sheet music. Thus there are no changes of tempo, rubato or phrasing on normal pianola rolls, and instead the operator is provided with a tempo control, which must be used to create musical performances. 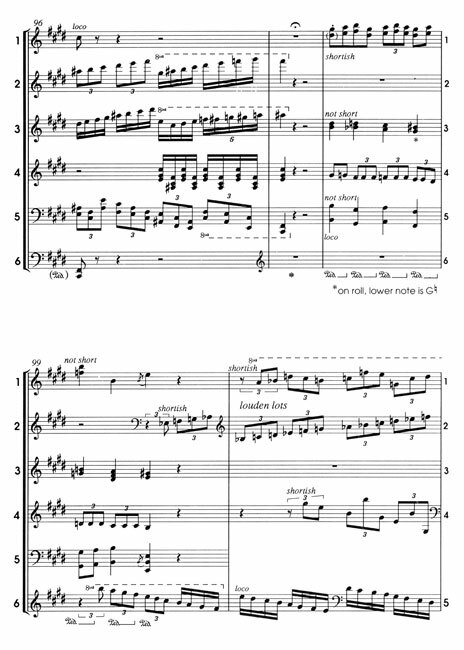 To take the simplest of examples, the famous opening of Beethoven's Fifth, with its dramatic pauses, would rush inexorably past on a standard music roll, if the pianolist were not ready to delay its course appropriately. the dotted line is a rough guide to dynamics. By late 1904 the firm of Michael Welte & Soehne in Freiburg-im-Breisgau, Germany, had developed a new type of player piano, known at first as the Welte-Mignon, and this was followed in the autumn of 1907 by the Dea piano, manufactured by Ludwig Hupfeld in Leipzig. Both these instruments and their competitors have over the years come to be known as reproducing pianos, the other main systems being the Duo-Art and the Ampico. Reproducing pianos are so called because they are able to reproduce the rubato, dynamics and pedalling - in short, the complete performance - of the pianists who recorded for them. Nearly all the major pianists of the early twentieth century made rolls for the reproducing piano, and these recordings form an important historical repertoire of romantic piano music and interpretation, as well as jazz and ragtime. 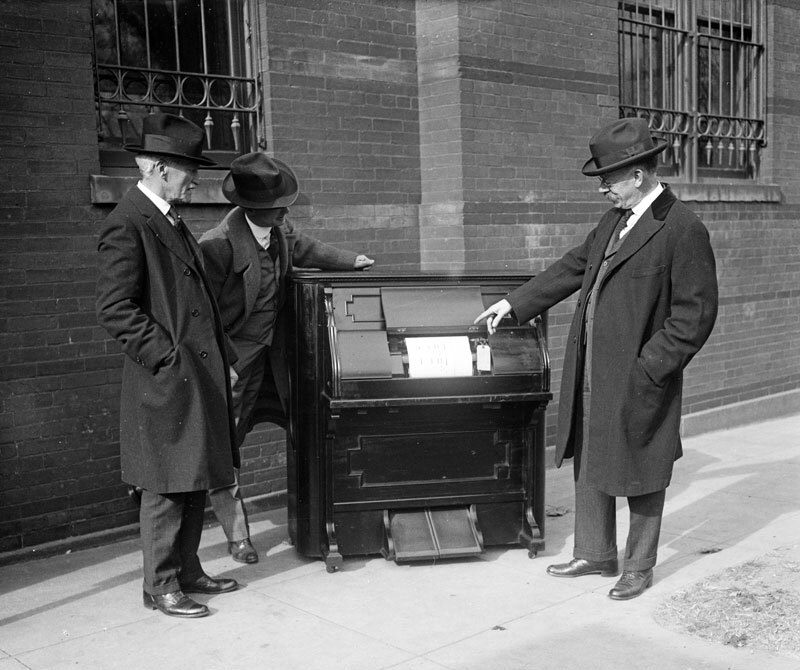 The first era of the player piano came to an effective end in the early 1930s, with sales of instruments all but ceasing during and after the Depression. 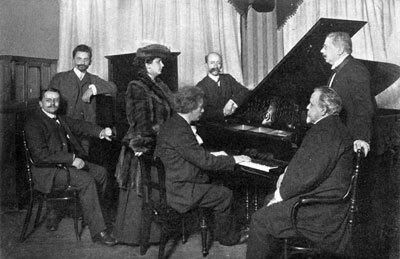 Paderewski recording for the Welte-Mignon at the Leipzig Fair - 27 February 1906. Besides playing works from the standard piano repertoire, pianolas may be used for music unlimited by the restrictions of the human hand. 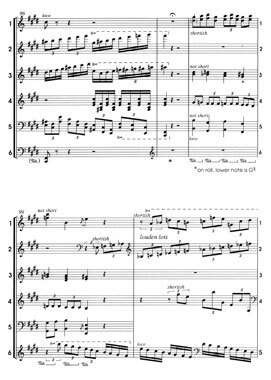 Well over one hundred composers have written or arranged special pianola compositions over the years, including Stravinsky, Hindemith, Milhaud, Percy Grainger and Herbert Howells. 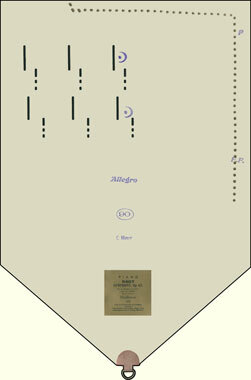 An excerpt from the score of Percy Grainger's "Shepherd's Hey", arranged for Pianola by the Composer. In recent times the pianola was used by the late American composer, Conlon Nancarrow, for an extended series of musical studies, and there are currently several composers writing contemporary music for the instrument. 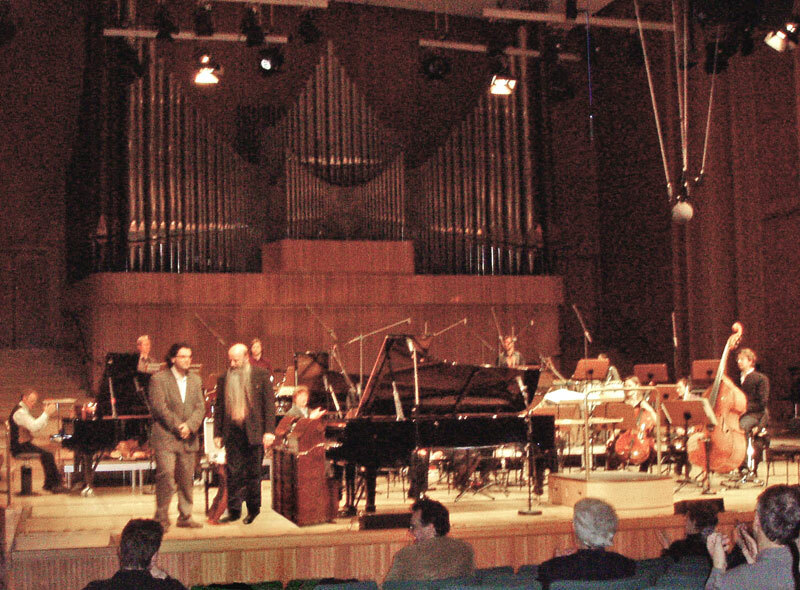 The première of Paul Usher's "Nancarrow Concerto", for Pianola and Chamber Orchestra, at the West German Radio - Cologne, 13 November 2004.